A romantic historical novel from the #1 New York Times bestselling author of Seeing Red about an independent woman who runs a boarding house in Dust Bowl Texas. Ella Baron runs her Texas boarding house with the efficiency of a ship’s captain and the grace of a gentlewoman. She cooks, cleans, launders, and cares for her ten-year-old son, Solly, a sweet but challenging child whose busy behavior and failure to speak elicits undesired advice from others in town. Ella’s plate is full from sunup to sundown. When a room in her boarding house opens up, the respected town doctor brings Ella a new boarder―the handsome and gallant Mr. David Rainwater—but Ella is immediately resistant to opening up her home to this mysterious stranger. Racial tensions, the financial strain of livelihoods in cotton drying up into dust, and the threat of political instability swirl together into a tornado on the horizon. One thing is certain: the winds of change are blowing all over Texas—and through the cracks in the life that Ella Barron has painstakingly built. This is the story of a woman who takes her life’s circumstances in both hands, but who will be forced to reckon with the chaos of her historical circumstances.. This reading group guide for Rainwater includes an introduction, discussion questions, ideas for enhancing your book club, and a Q&A. The suggested questions are intended to help your reading group find new and interesting angles and topics for your discussion. We hope that these ideas will enrich your conversation and increase your enjoyment of the book. Ella Barron runs her Texas boardinghouse with an efficiency that ensures her life will be kept in perfect balance. When a new boarder moves in—the soft-spoken, insightful Mr. Rainwater—that careful balance is upset in ways that Ella could never have predicted. Faced with the challenges of rearing her autistic son alone and surviving the hardships imposed by economic crisis, the last thing Ella needs is an additional burden. But from Mr. Rainwater she learns a bittersweet truth—that love is worth whatever price one must pay for it. 1. What qualities does Ella Brown possess? What is her greatest strength? What is her greatest weakness? Which qualities are inherent and which do you attribute to her situation in life? 2. 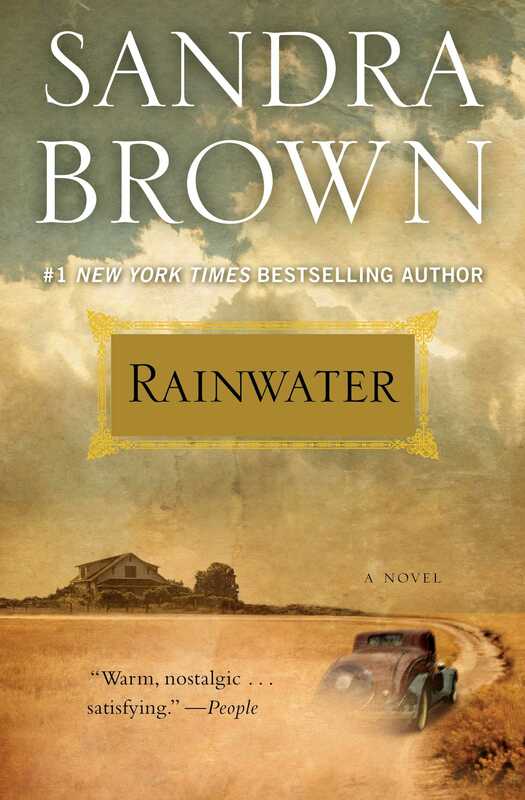 Rainwater is set in Depression-era Texas. What details does Brown use to create atmosphere? How does the setting affect the action of the story? 3. It’s clear from the beginning that Ella wants to prevent Solly’s odd behavior from being misunderstood and ridiculed, and to avoid a situation which would result in his being taken away from her and institutionalized. Why does Ella reject the advice of Dr. Kincaid and Mr. Rainwater? Is maternal love impeding her from making a decision. 4. Mr. Rainwater is an outsider, which automatically makes him an object of speculation and curiosity. Why does he want to keep his illness and his affluence a secret? What clues to both did you find? Did you have any unanswered questions about him? 5. The small-town grapevine plays a dramatic role in the story. Discuss the ways in which it was beneficial, and ways in which the effects of gossip were damaging. Would the story have unfolded differently had it been set in a larger city? How so? 6. The financial strain of the era influences the actions of the characters. How does Brown portray the dire straits of the poor? Did the kindness and charity of Ella, Margaret, and others surprise you? 7. The showdown between Conrad Ellis’s gang and the hungry mob is a pivotal scene. The actions and dialog of each character reveal much about that character. What is each party trying to protect or gain? Who is right and who is wrong? 8. Discuss how the relationship between Ella and Rainwater evolves from that of landlady and boarder into a loving one. How would you describe their relationship? Both of these characters are coping with a personal calamity—how does that influence their behavior toward each other? Would they have fallen in love had their circumstances not been as bleak? 9. What different kinds of prejudices did you find in the story and how were they expressed? Are there commonalities between the oppressed groups? 10. Describe the black community’s affection for Brother Calvin. What does he represent to them? Why is he so highly admired by people of both races? 11. Is Brother Calvin a hero? Is he a martyr? Are the qualities of a Depression-era hero different from a modern hero? 12. At the end of the novel, why does Mr. Rainwater take responsibility for Solly’s actions? Was he protecting Solly or punishing himself? Did his health or love for Ella factor into the decision? Is he a hero? 13. The novel is framed as a flashback. Did this add to the suspense? 14. Except for the prologue and epilogue, every scene is told from Ella’s point of view. Did you realize this as you were reading it? Did Brown do this intentionally? Why? 15. Do you see any parallels between the financial hardships then and those facing our nation now? How are they similar and how do they differ? In general, do people respond to differently now to setbacks than people who lived through the Great Depression did? 1. What was your inspiration for this novel? A vivid memory of my father’s childhood occurred when he was about eight years old. His father, my grandfather, had a showdown with armed federal agents who arrived at his dairy farm demanding that he pour out milk he couldn’t sell because of an over-supplied market. My grandfather refused to waste good milk when so many families in the area were going hungry. Gun-toting relatives backed him up, and eventually the agents retreated. No shots were fired, but it was a tense situation that obviously made a lasting memory for my father. My grandfather continued giving away his surplus milk. I also wanted to write about a fiercely independent and unhappy woman who is taught how to live by a man who is dying. 2. How was writing a historical novel different from the suspense novels you regularly write? Writing Rainwater was a refreshing change of pace . . . a change of everything, in fact. Typically I have a fairly good grip on the plot of a suspense novel before I set about writing it. I must know beforehand how the mystery ultimately will be solved. With Rainwater, I began with Dr. Kincaid bringing David Rainwater to Ella’s door and then let the story unfold on its own. 3. How did your background as a Texan influence this novel? Both sets of grandparents lived in the small Texas town that I used as my model for Gilead. When I was a little girl, it was a big treat to walk from their houses to “town” to get their mail from the post office or to pick up something from the grocery store, which was exactly like Mr. Randall’s. I was always fascinated by the stories my grandparents and parents told of surviving the Depression. For instance, my maternal grandfather worked on the Katy railroad. He made forty-eight dollars a month – and twelve of it paid the rent on the railroad-owned house in which the family lived. He supported a wife and five children on thirty-six dollars a month. Yet they were a happy, loving family. Those hard times didn’t make them bitter; it made them appreciative and strong. 4. Did you research the era before you set out writing? If so, what sources did you consult? Yes, a lot of research was required, particularly into the various government programs – when they went into effect, when they were actively being carried out. The stories that were most wrenching were eyewitness accounts of livestock being shot, not just in Texas but in many plains states. Sometimes it was an entire herd; other times it was the family milk cow. People alive today remember how devastating it was to watch that heart-wrenching slaughter. I used the Internet for newspaper stories and tapped into various libraries to read journals and printed transcripts of interviews. 5. Did you feel a connection between yourself and Ella—as a woman or a mother? As both. I fell as deeply in love with Rainwater as Ella did. As a mother, my heart ached for her. I could appreciate how terribly Solly’s rejection of her touch must have hurt. I get my feelings hurt when the kids don’t call! How horrible it must have been for Ella each time her son rebuffed her affections. 6. Have you had personal experience with prejudice? How did that affect your writing? Again, I reference my grandfather, the railroad man. During the Depression, one of the men who worked on his crew, a black man, owed him some trifling debt. But he was unable to pay it. One day he came to my grandfather’s back door with a hen and offered it as payment. My grandfather said, “That’s a fine chicken, and I’ll accept it, but only if you bring it to me through the front door.” The lesson passed down from him through my mother was that everyone deserved to be treated with “front door” dignity. 7. What inspired your idea to make Solly an “idiot savant”? This will sound strange, and probably a bit cheeky, but it wasn’t an idea that was inspired. That’s just what Solly was. I didn’t know it until he spilled the starch and had his violent fit. It was as surprising to me as it was to Rainwater, who witnessed his autistic behavior for the first time. Then, having researched autism and knowing how misunderstood it would have been during that time period, I realized how well it played into the story. 8. Did the current economic climate influence your novel at all? That was rather a bizarre coincidence. I began writing Rainwater before the full impact of the recession had been felt, or even forecast. 9. Do you have any plans for another book? If so, what will it be about? I’ve been requested to write another book in the vein of Rainwater. I’m seriously considering it. I’d very much like to if a story compels me the way this one did, and if the timing is right. 10. Your descriptions of Ella’s Southern cooking were so detailed—are you a cook yourself? If so, what are your favorite recipes? I’m no cook, but I love to eat. Usually food tastes best when there isn’t a recipe, just a cook who knows what foods and seasonings go well together. I love the “country food” like I described in the book, because that’s what I grew up eating. Southern cooking isn’t healthy by today’s standards, but it’s delicious, mostly because of the liberal use of bacon grease for flavoring. And we put gravy on everything! 11. Solly’s brother refuses to sell his watch—a family heirloom from his father Mr. Rainwater. Are there any family relics or antiques that you hold onto? My grandmother’s wedding ring, a solid gold band. Sacrificially, I think, my mother gave it to me. Whenever I wear it, I feel both of them with me.